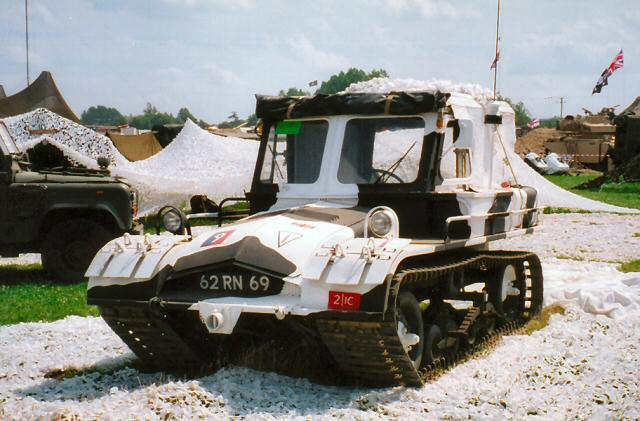 Heliportable over snow vehicle for arctic operations in Norway on NATO's Northern flank, Royal Marines 1970 - 1980. Half ton cargo vehicle with 1600 cc VW engine, speed 24 km/h. Gradient 60 degrees, ground pressure 0.05 kg/sq. cm. A/T version available with Wombat. Armament l x 7.62 mm L7A2 Machine-Gun (if' fitted); Crew 2 + 8-10; Weight in action 4,200 kg; Length 6.172 m; Height 2.21 m; Width 1.759 m; Ground clearance 0.3 m; Maximum road speed 39 knm/h; Range (roads) 400 km; Engine type Volvo type B18 petrol; Engine power 91 bhp; Engine capacity 1.78 litres; Fuel capacity 156 litres. 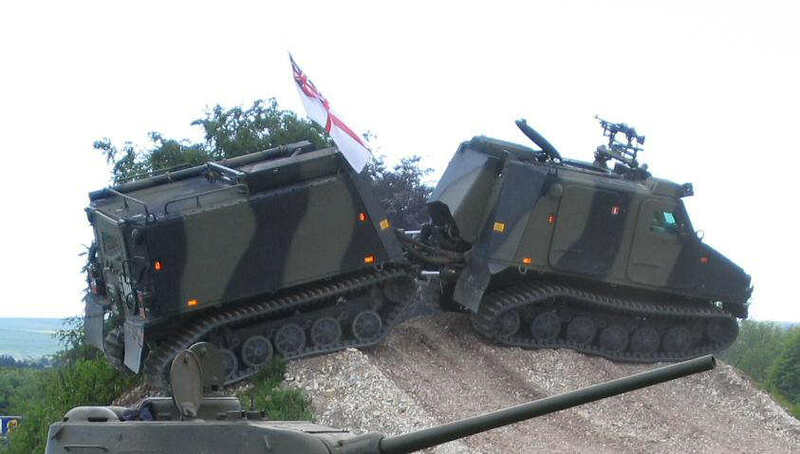 Service in Norway with the Army, RAF and Royal Marines as a multi-purpose carrier, artillery tractor, REME support vehicle, mortar carrier, ambulance, and other roles. Replaced by Bv206. Armament 1 x 7.62 mm L7A2 Machine Gun (if fitted); Cab seating (front unit) 5, (rear unit) 10 or 11; Weight loaded 6,740 kg; Length 6.9 m; Height 2.4 m; Width 1.87 m; Track width 0.62 m; Ground clearance 0.35 m; Maximum road speed 52 km/h; Maximum water speed 3 km/h; Range (roads) 300 km; Engine type Mercedes-Benz OM 603.950 diesel; Engine capacity 2.996 litres; Engine power 136 hp at 4,600 rpm. 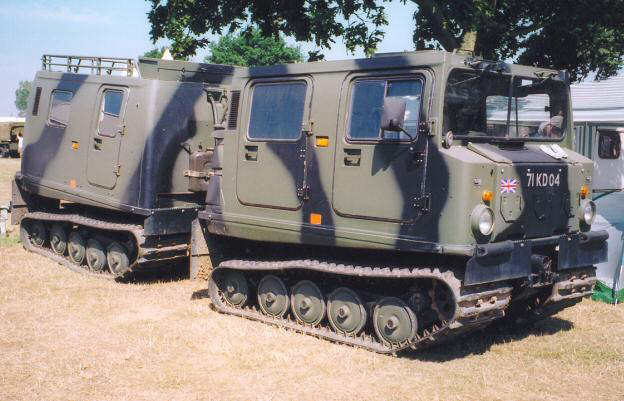 First ordered in 1981, over 600 of these vehicles saw British service. 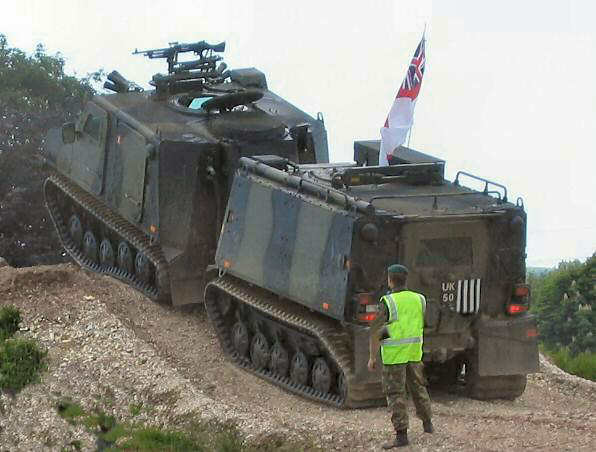 The first production Viking was delivered in July 2003;108 Vikings have been ordered for the Royal Marines.